Cheese and Chocolate: Sweetheart Cupcakes! I don't know what to think of Valentine's Day. I know it's just a made up holiday that was created to get happy couples to spend money after Christmas, but I almost like it anyway. I'd say that maybe it makes me long for those days in Elementary school where you'd exchange those silly little V-day cards and Sweetheart candies and you'd feel loved for a day. But no, that's not it. I mostly got the pity cards because you *had* to give cards to everyone in the class. Then again, I had to give cards to all the jerks in the class too, so I guess it goes both ways. In the end, I don't think I really like Valentine's day. I just like to have an excuse to make silly, cutesie little baked goods and stuff my face with chocolate. Don't judge me. My best friend and I saw this recipe on Allrecipes over a year ago and I've been wanting to make them ever since. They're just so damn adorable. I wanted to elevate mine a touch (read: make things more difficult for myself) so I used a white cake recipe and made my own buttercream. Go ahead and used a boxed cake mix and buy your favorite frosting to try this method though if you'd like. 1. Center a rack in the oven and preheat the oven to 350 degrees F. Line a muffin tin (and a half) with cupcake liners. 4. Put the sugar and lemon zest in a mixer bowl or another large bowl and rub them together with your fingers until the sugar is moist and fragrant. Add the butter and beat at medium speed for 3 minutes, until the butter and sugar are very light. 5. Beat in the extract, then add one third of the flour mixture (lower the speed for a second so the flour doesn't fight back, will you?) Beat in half of the milk-egg mixture, then beat in half of the remaining dry ingredients until incorporated. Add the rest of the milk and eggs beating until the batter is homogeneous, then add the last of the dry ingredients. Beat the batter for a good 2 minutes so everything is well incorporated and smooth. 6. 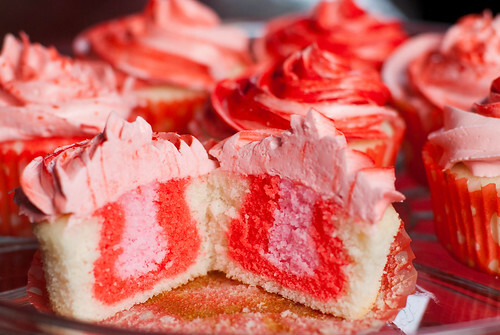 Fill each cupcake liner to about 1/3 full with the white batter and set aside. 7. Stir a few drops of food coloring into the remaining batter until it is a light pink (add a little at a time - you can always add more, but you can't take it away!) Pour 1/3 of the pink batter into a pastry bag or ziploc bag and set aside. 8. Add several more drops of food coloring into the remaining batter until you have a nice red. Pour the red into another pastry bag or ziploc bag. 9. Cut the tip of the red batter bag off and stick the open tip into the middle of each cup of white batter and squeeze a couple tablespoons of red batter into each one. Be careful as it is quite runny! 10. Cut the corner off the bag with the pink batter and stick the open tip into the middle of the red batter and add about a tablespoon of the pink batter into each cup. 11. Bake cupcakes for about 20-25 minutes, or until tops are a touch golden and a toothpick inserted into the center comes out with a bare crumb. 12. Transfer the muffin tins to cooling racks and cool for about 5 minutes. Then remove cupcakes and allow to cool completely before frosting. 1. Combine eggs, sugar, Chambord and salt in heatproof bowl. Place bowl over pan of simmering water. Whisking gently but constantly, heat mixture until thin and foamy and registers 160 degrees F on a thermometer. 2. Place the egg mixture into the bowl of a stand mixer and beat on medium-high speed with the whisk attachment until light, fluffy and cooled to room temperature, about 5 minutes. (You can do this with a hand mixer as well, but you may have to beat it for a bit longer.) Reduce speed to medium and add the butter one piece at a time, waiting for it to be fully incorporated before adding the next piece. (The mixture may look curdled after adding half the butter, but it will smooth out with additional butter.) Once all butter is added, add the powdered sugar and beat for one minute until light, fluffy and smooth. Can be covered and refrigerated for up to 5 days. 1. 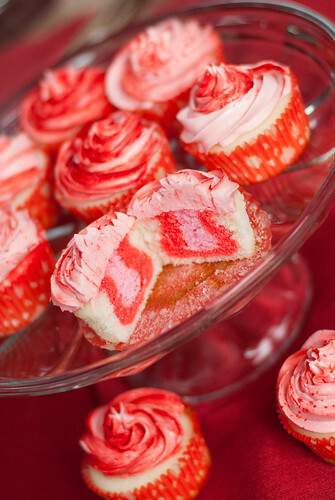 You can keep the frosting white, or add a little food coloring to make it pink as I did. 2. To get the striping effect, fit a pastry bag with a star tip, and paint a couple stripes of red food coloring inside of the bag. Add the buttercream to the bag and pipe onto the cupcake, spiraling from the outside in until you have a pretty little swirl! 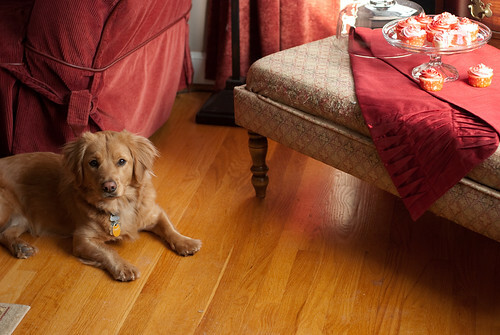 And a bonus shot of my cutie stalking my cupcakes! These are absolutely stunning! So perfect for Valentines day. That bokeh is as delicious as those cupcakes look! Where did you get the cupcake papers? Thanks for the kind words! I don't remember where I bought these wrappers since I've had them for a little while. It was either Michael's or a local kitchen store in my area. you really captured beautiful colors in your cup cakes. I like the frosting technique too. Looks like a wonderful recipe. Love these. They look amazing!!!! 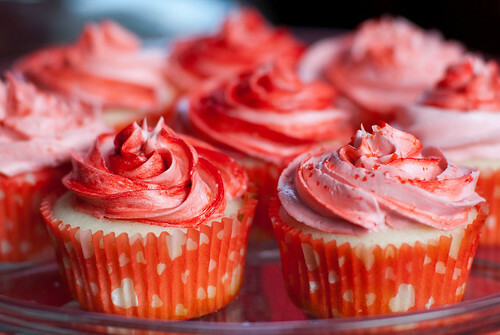 Beautiful cupcakes. Thank you for sharing. these cupcakes are awesome! I just made some! Delicious looking cupcakes! Did you get the upside down omega shape in each of the cupcakes, or did each one look different on the inside?